"These scientists employed soil re-mineralization and regeneration techniques,employing the use of ground stone dust or sea vegetation, and green (plant)compost, and the periodic aeration of plant or tree roots through cultivation. The results were indeed phenomenal. Marketed spinach grown on ordinary soil contained from 600 to 1,600 parts per billion of iodine, whereas spinach grow non re-mineralized soil contained as high as 640,000 parts per billion. Testing revealed that various vegetables grown in Savage's "mineral garden" possessed as much as 400% more iron and other minerals than crops grown by standard methods." Thanks to Tracy Jones who really got me excited about this unique method. Hope many will build and report back on their experiences! The basic theory of the new Organic Tank System is that the nutritional value of a food, including its content of vitamins and minerals, depends on the mineral content of the soil, and on a sufficient supply of moisture by means of which soil minerals are conveyed to the roots of plants. By filling long tanks with a special soil mixture containing various powdered rock and seaweed material, and by providing such tanks with a system of continual, circulating irrigation, it is possible to provide plants with optimal conditions of mineral nourishment, thereby enabling them to create superior quantities of vitamins. One of the Super Vegetables thus produced should be able to provide the quantity of vitamins and minerals otherwise provided by a very much greater quantity of ordinary vege­tables. One of the reasons why many people today overeat is because foods fail to provide them with the trace minerals and vitamins they require. This causes a chronic condition of "hidden hunger" which plentiful eating of demineralized foods fails to appease. In fact their cells are in a state of "inner starvation" and their endocrine glands degenerate from trace mineral deficiency, causing the pre­mature appearance of old age. When the cells of the body fail to obtain essential trace minerals from foods, both body and brain degenerate. Premature old age is the most common symptom of such degeneration. Organic Super Foods produced in mineralized tanks will be able to prevent and correct vitamin and mineral deficiencies much better than can artificial concentrates. Rather than subsisting on mineral deficient foods and then using vitamin and mineral concentrates to overcome their deficiencies, one should obtain in all the vitamins and minerals one requires, in a natural, organic form, by raising one's own Organic Super Foods in mineralized tanks. Such tanks may be kept on roofs of city buildings, or on porches or around one's house or in one's back yard. They may be made of boards and should be waterproof, so that the irrigating solution that is applied on top runs off from the bottom so that it may be conveyed or collected, and later used over again. For this purpose it is important that the tank slopes downward a little, with a drain at the lower end. The water that escapes should not be thrown away, but conserved and returned to the upper resevoir from which the tanks receive their irrigating solution. This solution will contain colloidal minerals dissolved from the seaweed and powdered rock material in the tank through which it passes, as well as what is derived from the soil itself. This method differs from hydroponics in that no chemicals are used, for chemicals create foods of inferior nutritional and health value, even if normal in appearance or of commercial value. The soil mixture in the tanks should be composed of soil, sand, humus (peat moss, leaf mold, etc. ), wood ashes, powdered rock, lime­stone, rock phosphate, colloidal phosphate, marl, ground dried seaweed, etc. Do not use piped city water, but spring or well water in the upper resevoir; and no water that was chlorinated, aluminized or fluoridated. From the upper resevoir the water is led to the upper part of each tank, by a carefully regulated stream that does not flow too fast or too slow, but just enough to keep the soil in the tank moist at all times, but not too wet. At the bottom of each tank, gravel of varying degrees of fine­ness or coarseness should be placed in layers, the coarser at the bottom and the finer on top, so that there will be good drainage and that the solution applied above may be collected from the lower end of the downward sloping tank, and then used over and over again. Each time that it is used, the solution will become richer and richer in minerals. Plants grown under such exceptional conditions will be better-fed than ordinary plants and their diet will be richer in minerals, enabling them to produce more vitamins. In 'this way it will be possible to create Organic Super Foods, exceptionally high in vita­mins and minerals, more so than is possible in the open ground where soil minerals, dissolved and leached by irrigation water, are carried downward, below the reach of the roots of plants, and thus lost. Also, when powdered rock plant foods are used, these take time to become soluable; and after these minerals enter into solution in rain water or irrigation water, they also are lost from the topsoil and carried to the subsoil, beyond the reach of the roots of plants. The advan­tage of this new Organic Tank Gardening system is that all minerals added to the soil in which plants grow are conserved and rendered in­creasingly available as their concentration in the circulating irri­gating solution increases. For more information on this subject see last chapter of our book "ARE YOU BEING POISONED BY NEW SUPER SPRAYS? This chapter is called "ORGANIC TANK GARDENING." Page 42-43, Are The New Super Sprays Endangering Your Health? "In the last chapter, we discussed several ways to solve the spray poison problem, and mentioned that one way out of the dilemma is to grow one's own foods. We shall now describe a very practical method by which this can be done-even by city dwellers who have no back yard or garden space, but who have a roof. * The idea was acquired while traveling a certain part of Ecuador where there was no rainfall, and where it was impossible to irrigate from wells. People there grew their fresh greens in long tanks which they filled with rich soil and kept moist. In this way they always had a supply of fresh lettuce and other greens. The Organic Tank Gardening method differs from hydroponics in that, while vegetables are grown in tanks, no chemicals are used. Instead, various natural and colloidal mineral compounds are mixed with the soil in the tanks, as well as seaweed material, wood ashes, etc. Colloidal phosphate, which is a prehistoric marine deposit containing over twenty minerals, should be added also to the soil mixture, plus powdered GRANITE. Ground dried seaweed is quite soluble and supplies potash, plus many trace minerals. Hardwood ashes are a good source of potash, calcium and other natural minerals. These natural mineral fertilizers should be mixed with rich soil and sources of vegetable humus, as leaf mold, peat moss, etc. Such a combination provides a balanced plant food and can produce vegetables extremely high in vitamins and minerals, which are RESISTANT to insects and disease and which need no spraying. After filling the tank, which should be waterproof, with the proper soil mixture, the next step is to arrange for a system of irrigation. This should be based on the idea that the water that enters the upper part of the tank, after passing through it and dissolving natural, organic minerals, should be collected and teen circulated over again, supplying valuable plant food that is immediately available. One method of doing this is to place a reservoir, or barrel, at the upper end of the tank, which should be slightly incline toward the lower end, where there should be an outlet from where the water leaves and is collected in another barrel, placed in a hole in the ground. Then the water from the lower barrel can be either pumped back to the upper barrel and used over again, which can be done with a fish tank electric pump, or it can be transferred by hand by means of a pail. Where one has more than one tank, a common barrel of reservoir at the upper end can supply all tanks by rubber tubing, whose outlet should be subject to control by means of a valve that can be opened or shut to permit more or less water to flow. The tank should be kept moist at all times, but not too wet. The combination of an abundance of vegetable humus (NO ANIMAL MANURE SHOULD BE USED), plus an abundance of trace minerals of organic and rock origin, and plenty of water, together with sunshine, * provide the basis condition for producing vegetables, melons, berries, corn, etc. or superior nutritional value, many times richer in vitamins and minerals than foods not supplied with continual moisture. A single "super vegetable thus produced should be equivalent, in vitamin and mineral value, to many similar vegetables produced by the old-fashion method, especially when chemical fertilizers were employed, since these lead to the presence of chemical residues in vegetables which interfere with the proper assimilation of their minerals and vitamins. By the Organic Tank Gardening method, super-vitaminized and super-mineralized foods may be produced, capable of forming a super race. These foods will be so rich in nutrients that much less of them need be eaten, and consequently grown, than old-fashioned foods. The new emphasis will be on quality, rather than quantity. 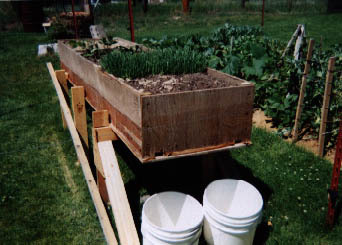 Recognition of the fact that the new tank method of raising foods in continually irrigated mineralized soils will create foods far superior to those grown by the aid of composts containing animal manure will cause many health seekers to establish tank gardens, in order to raise their own home-grown supply of greens, etc. This will also provide an interesting hobby or pastime. Such tanks can be placed on roofs, porches or anywhere around one's house. * When this was written, I don't think plant grow lights were available to use during the winter months with tanks located in warm rooms, which now makes it possible in the northern climates. * The capitalizations of words within the text are my emphasis. * I've designed an inexpensive tank that's easy to assemble. It has room for seven square feet of vegetables, wheat grass, or just about anything you wish to place on your table for dinner. It's easy to maintain and fun to watch your plants grow quickly, knowing they're rich in all the nutrients your body normally requires. In my soil I use minerals, but no chemicals of any kind. I've yet to see any insects looking for a handout. These little buggers normally feed on plants with few nutrients grown in dead soil. This is like the bugs in your body, which do their best to get rid of your waste. Both are doing what they were designed to do. 1- 4x8 new or used ½" or ¾ plywood sheet. 3 straight 2x2x8' pine or other inexpensive wood boards. 1 lb. 1 5/8 plaster board screws. 128 sq. in. fiberglass screen wire. Assembly: There's an old saying: Measure twice, cut once. Cut 1' off the plywood sheet and set aside. Mark lengthwise 4- 1' sections across the plywood sheet. Cut these sections and label them #1, #2, #3, #4. Cut 1' off of 2 of the 2x2x8' sticks. Place them under plywood #2, carefully lining them up flush with the plywood's outer edge. Screw the plywood to the 2x2's, 1 screw every 6. In plywood #3, drill 2- 1 holes 1 1/2 from one end and 4 from the side edges. Drill 3 more holes on each side, 4 from the edges, evenly spaced to leave 8 at the other end (far end). With 2x2s face up, line # 2 with waxed butcher paper. Place #3 on top of # 2 and screw the plywood to the 2x2's every 4. Make sure the screws are sunk into the plywood, but the screw heads do not extend above the board, and be careful not to twist the screw heads off when driving them in. You've just sandwiched the 2x2's creating a false bottom. Screw #1 and #4 to the 2x2s to form an open box without ends. Place screws every 4. Cover the entire open box end with the holes 8 in (far end) by lining up one end of the 1'x4' piece of plywood. Mark the 1'x4' board and cut, then tack it to end of box with 4 screws in each corner. At the other end, mark the remaining plywood to leave a 2x8 opening for drainage at the bottom of the box. You'll see the butcher paper and into the false bottom. Tack this end. Cut the last 2x2x 8' stick into 5- 9 lengths and 2- 12 lengths. With screws 3 apart, secure 4 lengths vertically in the box corners, screwing from the outside through the plywood. With 3 screws, secure the fifth piece across the bottom at the completely enclosed end (far end), screwing from the outside. The drain end will have no cross piece. Run a bead of wood glue around the inner bottom edge sealing any cracks. Let glue dry and reapply where cracks still exist. You may use sawdust to fill any large cracks and then glue over it, rubbing glue into cracks. Cut fiberglass screen into 4 squares and thumbtack over drain holes. Place the2- 2x2x12 pieces, 28 from each end, across the top. They will hold the sides together at the top. Use 2 screws to secure each end of each piece (8 screws). You now have your first Organic Tank Gardening box like I use. If you decide to assemble a two-foot wide box, then figure the necessary material accordingly. Place your tank box on anything substantial that will hold it 22 above the surface you desire to use. This will allow room to place a five-gallon bucket at a slightly tilted, lower end where the drain outlet is (2x8 space) to catch the water that flows through the soil. You reuse the water by pouring it back over the soil in the box. 20 cups of Florida soft rock phosphate. 1 cup of Algit, the Norwegian kelp meal. 40 cups of fine granite, no bigger than the size of Perlite, preferably dust size like the Azomite. Mix well with the soil before you put the soil in your box. You may have to fill the box first, empty it into a mixing container, and refill the box. This can be done in segments with the proper proportions used for each segment. I also throw in a few earthworms. Florida soft rock phosphate and Algit kelp, www.groworganic.com, or 1-888-784-1722. Azomite. I'm sure you'll find, as I have, this method is fantastic for growing your organic vegetables. One of the features is that, with a grow lamp, you can have vegetables all year long if you place your tank box inside a warm enclosure. I'm trying to convince my wife to allow one of our tank boxes in our laundry room. I haven't made much progress yet, but I'm pretty persistent and will keep trying. Thank you and have a high quality, abundant crop. For convenience a word document on the construction portion of this post is available here. These scientists employed soil re-mineralization and regeneration techniques,employing the use of ground stone dust or sea vegetation, and green (plant)compost, and the periodic aeration of plant or tree roots through cultivation. The results were indeed phenomenal. Marketed spinach grown on ordinary soil contained from 600 to 1,600 parts per billion of iodine, whereas spinach grow non re-mineralized soil contained as high as 640,000 parts per billion. Testing revealed that various vegetables grown in Savage's "mineral garden" possessed as much as 400% more iron and other minerals than crops grown by standard methods. The necessity of soil re-mineralization is based on the premise that over the millennia the earth's surface has undergone a progressive erosion of both its major and trace minerals. As well, the widespread and serious de-mineralization problem has been vastly exacerbated in this century by deforestation, massive mono-culture cropping, and heavy agrochemical dependency. Today the only place where the full range of vital minerals can be found is in the seabeds where streams and rivers have carried them, or in the earth's rocks. Thus the utilization of sea plants and rock dust became a central feature in strategic efforts to achieve balanced soil re-mineralization. The place of soil re-mineralization--as a fundamental health strategy--is corroborated not only by experimenters in improving plant and animal wellness,but as well in prehistoric fossil records. For instance, paleopathologist Roy L.Moodie has found that "the early faunas were free of disease" and that "the most ancient bacteria were harmless," i.e., non-pathogenic in nature. He maintains that"There are no known cases or examples of infection, no tumors, few traumatic lesions or injuries of any kind prior to Devonian" and that "the earliest animals were free from disease. It is also worth noting in this regard that the earliest book of antiquity in the Judeo-Christian record, Genesis, gives no account of any specific human diseases, and as well makes no reference to conditions such imbecility, blindness, deafness, or other deformities. I take it that what has happened to man has happened no less to his domesticated plants. Science has effected a marvelous progress in variety and fragmentation, but at the same time it has torn plants from their traditional conditions upon which their health depends. . . . here is, no doubt, I think, that modern man has made plant life in his own image. Part of today's larger shift toward environmental responsibility and sustain ability,are the commendable efforts to reduce excessive dependency on soil and plant chemicals in agricultural methods. However, the growing impetus toward"organic" approaches to agriculture relies heavily upon manure fertilizers. On this point Shelton comments that ". . . it has long been known that heavy manuring of the soil results in the plants grown thereon being subject to parasitic infestation because of their lack of health. I have proved that susceptibility to disease is greatest with large dressings of dung. It is the main cause of fungoid infections of plants . .. and bad eyesight, bad teeth, and kindred troubles in human beings. . .. As to [chemical] fertilizers, they often deplete the soil of its fertility and induce acidity. . . . Such poorly constituted crops cannot avoid, and must inevitably attract,any prevalent form of disease. At our own organic farms, not one papaya tree was lost during the severe disease epidemic of 1973 which followed Eastern Australia's 1972 partial drought. Every newspaper reported the severe plant losses of up to 90 percent of plantations from"three strains of virus. . .
"It was no strange or mystical phenomenon that our farm, with its organically mulched plants, registered not even a decline in crop production while other farmers in the district were bemoaning their huge losses. Obomsawin, Raymond M.D. Universal Immunization. Published by the Health Action Network Society, Burnaby, B.C., Canada. I read the material you sent about re-mineralization of foods. Sounds great, but I would have a few cautions. Using ground rock can be dangerous for several reasons. Many rocks are high in fluoride, cadmium and aluminum all of which are neurotoxic and are cell toxins. Many plants will preferentially take up these minerals from the soil and concentrate them in the plant. Tea is an example. Levels can reach several hundred PPM. I notice he suggest adding lime-treated soil. This will bind a lot of the fluoride and prevent the plant from absorbing it. As for the high iron level they see in the vegetables, first you don't want a lot of iron and second, the flavonods in the plants will prevent absorption anyway. I would suggest a modification of the method. I would suggest testing the rocks to be used for toxic heavy metals, especially mercury, cadmium, aluminum and fluoride and use only rocks only will low levels of these toxic metals. I think the methods has a lot of potential. Also important is the materials used to waterproof the system, since they can also supply toxins to the vegetables. With some refinements, this could be a tremendous leap forward in growing healthy foods. A safer way to waterproof the wood used in the tank is to apply "CedarShield". It is a non-toxic, organic product only available from the company by the same name, in Texas. It semi-petrifies the wood and one application lasts for a 'lifetime'. It's a little pricy but worth it. Regarding rock dust, the mineral analyses of various rock dust products are available on line. I use Gaia Green, a glacial gravel dust from British Columbia.